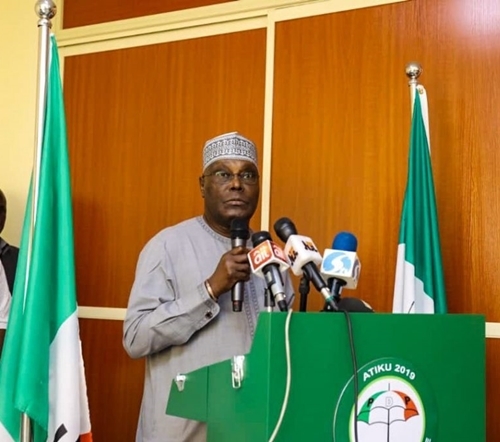 While speaking during an interactive session with PDP women leaders on Thursday, Atiku Abubakar, disclosed that he he is not talking politics when he says he has a soft spot for women. According to TheCable, the PDP presidential candidate who revealed that he has regards for women, and attributed it to the upbringing his mother gave to him, said his mother made him who he has become, and this in turn led to him being “sentimentally and emotionally attached to womanhood”. The former vice-president said, “Honestly, if you want to fight poverty in power, empower women. I can tell you why I believe this is so. Atiku who had earlier said that 40 percent of his cabinet will be made up of women and youths if he is elected in 2019, told the women to hold him accountable, while promising them a strong representation in his cabinet. He explained that during his reign as vice president, he initiated establishment of a micro finance bank with the interest of women in mind, through which 45,000 people have been lifted out of poverty in his state. “In terms of quantity and quality women will play a lead role in our administration. PDP has never from day 1, not try to advance or protect the interest of women. That is why, our first interactive session is with women. In this transition, this is the first interactive session we are having with any group. “I stand before you here today and I want you to hold me accountable. I will commit to a strong representation of women in our PDP government. And also recall that when I was the vice president, I demonstrated this belief. I brought some of the brightest women into our government. Therefore, gender should not be a barrier. “For those of you who might have come from the same state with me, some years ago, I decided to set up a micro finance bank and I brought management experts from Bangladesh, the first country that manages micro finance, and I gave instructions that made sure that 80% of your loans go to women.